Well yes I know really this just seems like I'm copying Plymothian Transit now! I had meant to have post this earlier in the week - but in the wealth of english essays to complete and engineering projects to be done for the deadlines tomorrow this completely slipped my mind! But thats life I suppose! 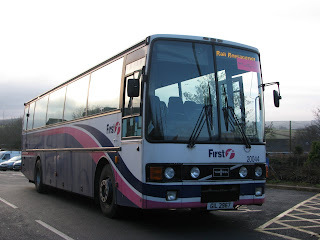 Anyway here shows FDC's Volvo B7 69079 one of the ones that has joined the fleet from Glasgow. On the side as you may have noticed is a rather obscure advert for the Herald, which personally I don't particularity like. It spoils the lines of the bus along with it being unpleasant for the passengers and it not really being compatible to use with the Ugobus branding! Certainly it is eye catching than the more standard big sticker along the side but whether it'll catch on I have my doubts! Some of you may have seen that other divisions of First have had an extra rail put on the roof to be able to put on a double decker style advert, but without the need for the extra deck! Who knows maybe that's on the way and this was a cheap fix? On arrival at Liskeard on Saturday I was greeted with a fabulous line up of coaches and I must be honest - I'd forgotten it was happening! It may have switched my journey around a bit going via Plymouth but there we go! 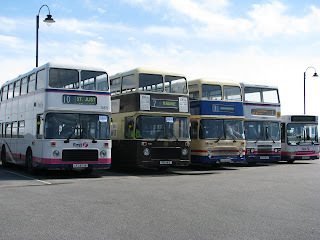 Anyway the coaches had just arrived on the run from Plymouth these being S313 SCV, GIL 2967 and M92 BOU. I know which one I would have gone for! Then on the journey back the other rotation was on hand to get me upto Plymouth these being a slightly newer selection including S314 SRL (still in the old livery which personal I prefer), T2 TRU in the Truronian Coaching livery, R308 JAF and bringing up the rear for the run to St Germans was S552 RWP! I must say seeing her there was quite a surprise. But was nice to see her being used once again - especially while Solos were failing all around her!!!! Training Vario S536 RWP was also there as the operations bus. 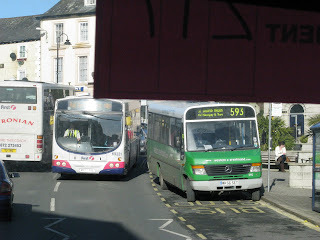 On the run through Liskeard there also appeared no less than three Volvo B7s including one in the 14/18 livery. All three were looking very empty when they went past. I presume these were working the intermediate station services. As I was whisked along aboard R308 JAF (that was the only one with places left after I'd taken pictures!) I couldn't help but think that really it would be nice to have coaches on more service routes. I mean yes I know in many respects its not practical these days and I'm sure wouldn't be greatly accepted by some bus users. 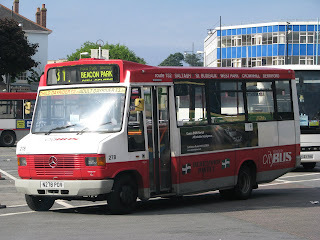 But thinking back to the days they were often used on services such as the 76/X8 to Bude did make me think that the B6 was never a fit replacement! 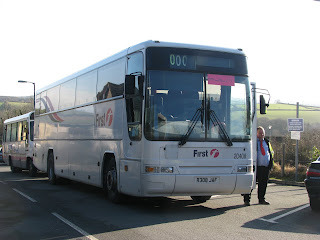 Though the Solos on the route are very good, you just can't beat a coach on a longer journey. But anyway back to my journey through to Plymouth and it was all running very smoothly. Though on reaching Plymouth the drivers took the somewhat unusual decision to come off the A38 straight after the bridge and continue through St Beaudeux. And this then proved to be the downfall. 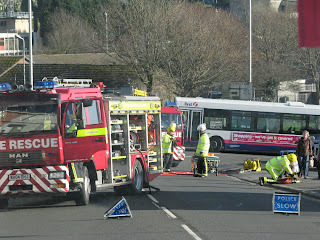 There had been a fairly serious accident on the main road, and the first 2 coaches had got through just before the road was closed leaving us on the other side! We waited there around 20minutes before turning around and heading back towards the A38. A quick blast and we came off again (at the junctions I would have come off in the first place!) and completely the journey at the station. A half hour trip increased to around an hour and 15! But ahh well, these things happen! 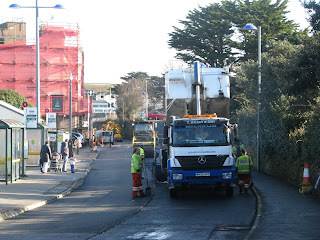 A quick visit to Newquay yesterday while trying to track down G901 TWS led me to see the temporary bus station that has been created in the Car Park just in front of of the Bus Station while re-surfacing takes place. 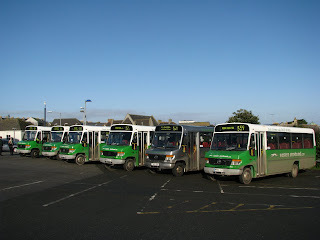 I must say it was quite a sight being greeted by 6 Varios all lined up ready to go. Was quite a nice way to do it looking on the blinds then heading over and then straight off up the hill. Its also quite nice for comparison shots! Just a quick post for now, a longer one will hopefully be done at some point to day but for now here's a view of one of Western Greyhound's new Dennis Tridents which have recently come from a previous life in Oxford. Newly painted this bus is looking very smart in the Dark green livery. And personally I think it looks better without the fancy wheel rims that Oxford put on their buses! Apologies for the picture, not the greatest but there were too many obstructions (i.e. the big orange merc! 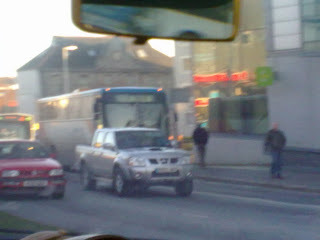 + the lorry) to get a good picture! G612 OTV (179) was the Volvo Citybus on the 26 today. It seems to actually be a regular occurrence that a Citybus of some kind appears on one of the 26 rostas, whether this is just problems with the newer Volvos on the route or whether this is actually built in. These have been seen during peak times on the 26 including when school buses are operating. Though still the new Volvos are being used on school services. They must request a Citybus by popular demand on the 26! She is still seen in the black livery of the 'Thunderbus' though of course without the Plymouth Sound branding! 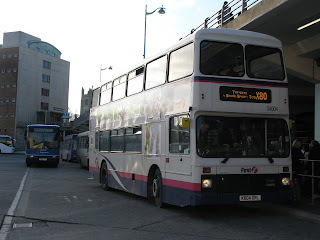 After an enquiry to PCB it has been said that the Solos will not appear on Plymouth services until they have gone through a full refit and paint up into the Citybus livery. If this will be the promised new version of the livery we are yet to know. Though 709 operation sounds like it still has a little while left to run. 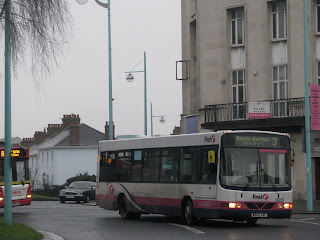 On council supported services such as 58/9 709s will still be a common sight as the contract does not state the service needs to be run with low floor buses. I'm sure this will therefore mean Citybus will eek out the length of time the 709s are used as long as possible before replacing them on the route under new contract terms. Of course you can see why they'd want to do this as well. The 709s have always been ultra reliable along with being far cheaper to run the Solos, while still giving a good standard of service. 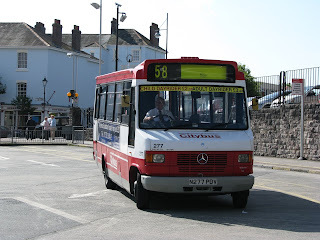 With thanks to Plymothian Transit, it has been annouced that the Mercedes 709s at Plymouth Citybus will be ending their lives very shortly. 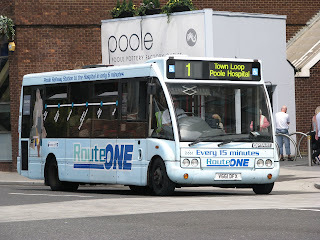 It is thought that the buses that will replace them are Optare Solos from Wilts and Dorset which have recently been replaced by newer Solos on 'RouteONE' in Poole. All of these Solos are V registered, a large amount still operate for W&D all over the town. Indeed W&D were the first company to operate the Solo and contributed heavily in the development of the original Solo. So grab your cameras yet again for what is pretty much the end of the true Minibus era. Of course the Solos are classed as a Minibus, but were designed specifically not to feel or look like a Minibus - something I think they've achieved very well. Apologises for the quality but its something I simply couldn't ignore. The picture shows Citybus' B176 VDV usually confined to the school runs into Cornwall - but today amazingly she was seen operating a peak time 26! 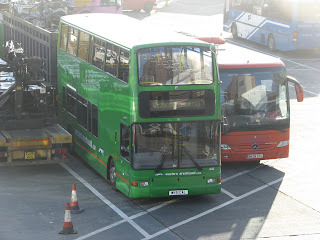 I'm guessing one of the Ex-London Volvos failed and this was rushed as a spare bus - seeing as it sits in the depot most of the day before returning to its depot in Liskeard. 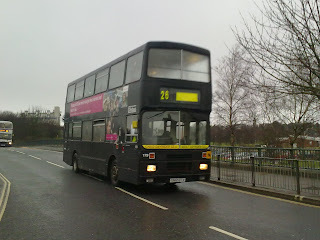 A very rare occasion to find such a bus on any service now, especially the oldest batch in the fleet. Would have been a right treat for passengers on the 26 though! I'd rather have one of them any day. I think its time to have a look at what really we're all most interested in - the old stuff! And firstly we'll go to the now pretty dispersed WNPG fleet. 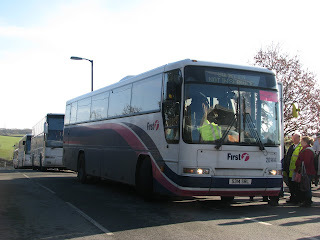 Of course as mentioned before they have been having problems sustaining the current fleet so have sadly had to cut back to just three buses these being LFJ 844W, VOD 125K and S412 GUB. It has now also been confirmed that the Cornwall Bus Preservation Group now own S529 RWP along with Leyland Olympian A754 VAF. The Penzance Running Day is returning for this year and I must say this is a highly recommended rally. This will be held on the 18th April with more details nearer the time. A week later on April 25th there will be a "Drive a bus day" at Westpoint. Again another event returning for this year, though this is only open to members of WHOTT. Then on 30th of May, two events clash these being Devon General Society's in Teignmouth and Dawlish. Along with Roselyn's running day in Par. Again more details nearer the time. That's all for now but keep an eye on the blog for information on forthcoming rallies. Yes its slightly overdue but here it is my brief review of the year. I know really it only scratches the surface of 2009 but there we go! Hope you enjoy. It seems to be the only thing I ever post about on this blog - but then again its always been what I'm most interested in is whats happening with the fleets of the South West. And this time comes the turn of the G-TWSs. These started life with Badgerline in Bristol and worked many of the routes in the area for many years, into the First Group era. 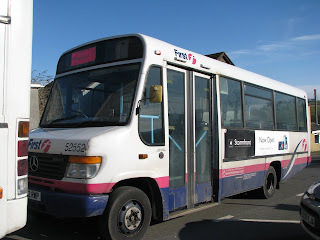 Some were then transferred to Southern National and were based in Taunton running various routes - including shuttles to Asda which a few of them were painted in. 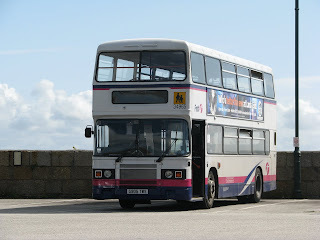 These then were brought down into Cornwall to help see off some of the older Olympians and Volvo Citybus'. But now this is the end for them and though its been fairly short lived, this is quite the end of an era. The last ECWs in Cornwall will pass and yes technically they arn't a proper ECW the iconic shape will be lost. The Olympian has never looked better and really the K-LAEs that have mainly replaced them just arn't the same! Though the Cummins that these are fitted with are no where near as good as the old Gardners the buses just seem to make up for it in character and comfort! Indeed these buses are in my opinion about the most comfortable vehicles FDC operates! So be quick getting your last pictures! G901 TWS is the last still surviving! I doubt many if any will make them out the other side of First Group either! I'm sorry its a terrible picture - but as you can understand very rushed! 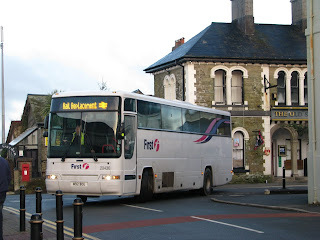 While going through Plymouth what did I see but one of the P-X Volvo B10M coaches on its old haunt of the X38! 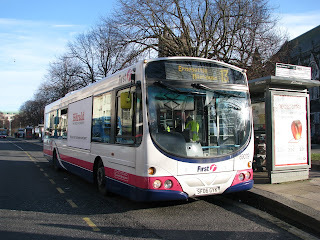 Of course these have been gone for a while now, replaced on the route by a mixture of Tridents and Enviro 400s. But was great to see a proper vehicle on the X38 again. Something that is actually made to do a route like that. Though really much like the X80 - it spends very little time on the A38 compared to the route of old when there was the X38 and X39. 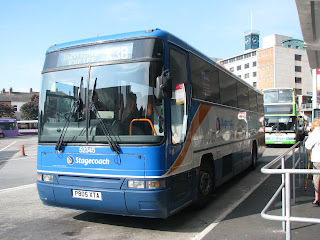 Since they were taken off the X38 they have driven the length and breath of the country doing Rail Replacement in many far off places in many other areas of Stagecoach. But this one found its way back home! I've included a better picture from a few years ago to illustrate what it should look like! And slightly further down again is a picture of what P803 XTA has now become. 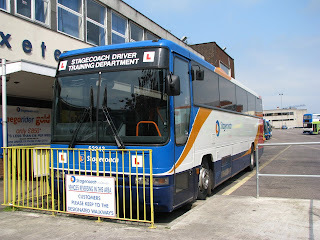 A Driver Training Vehicle! Though I've even seen this one being used on RR at times. News just in from David Sheppard is that Volvo B6, W605 PAF has been sighted being trailed along behind a tow truck! She seemed to want a day off like us in this cold weather! 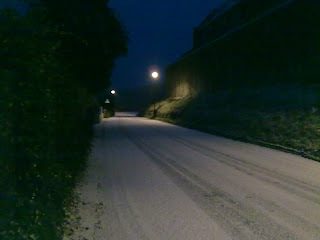 Snow (doesn't really) hit Cawsand area! Well I suppose its time for the first blog of 2010! 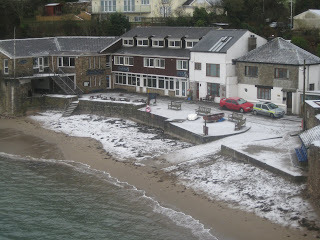 To start with pictures show the light dusting we did get in Cawsand over the past few days. Sorry for the 'delay' there was some snow in my keyboard! Anyway the only real thing to blog on is this weather! Though really as far as my local area goes, there has been no disruption to services at all! Infact they've been better than normal. A-Line have kept a totally normal service - actually running nearer on time than usual with Danny Goodard at the wheel - in place of Jim this week. The school service was also running until they were actually instructed to 'stop'. Torpoint students did actually make it to the school on Wednesday though the buses were told to turn around and take them back to their respective villages! This messed up FDC's plans for the day a bit but was nice for the kids! And onto FDC the 81C has also been running a normal service all week - apart from the buses not serving Great Park. In our opinion really this is an improvement! Great Park has always annoyed travellers on the 81C - increasing the journey time and along with it not being comfortable going over some 20-30 sleeping policemen many older people simply don't use 81C because of this! But there we go. I'm sure many of you noticed that FDC were very proud of being the only bus company running through parts of yesterday, and yes really they do deserve a congratulations. Several of the Service 3s I saw were not running to Barne Barton and instead had 3 - St Budeaux on the blind. But better than nothing I suppose!